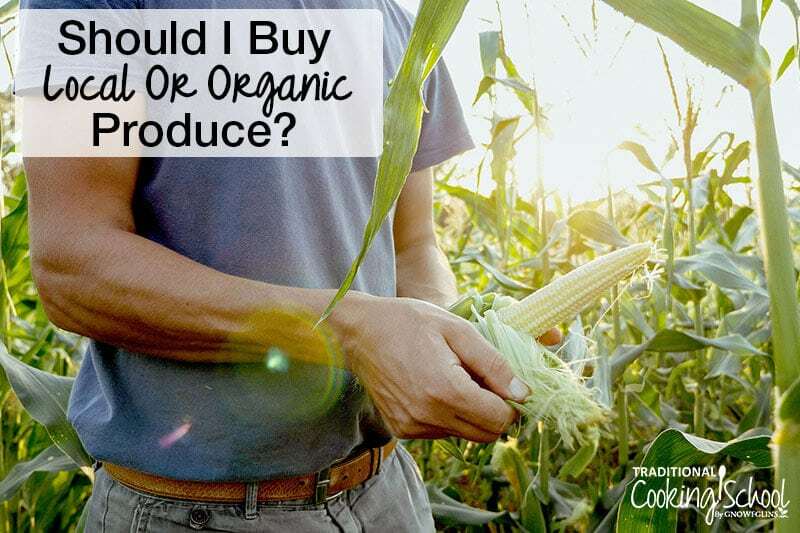 Should I Buy Local Or Organic Produce? We're thinking about the bounty of delicious, nourishing, fresh produce that only warm weather allows! Because, although you can buy a tomato in any supermarket year-round, only those who've tasted an organic, homegrown tomato know that a supermarket tomato in January and a fresh-from-the-vine tomato in July are nowhere close to the same food. What if you don't have access to organic, homegrown tomatoes (or other produce, for that matter)? Or, what if you can get homegrown tomatoes, but not organic ones? Is it better to eat organic fruits and vegetables or local? I live in Mississippi, and there are not organic farms. We have a lot of local farms, but we also have a lot of bugs so the farmers use pesticides to keep the plants alive. My in-laws grow food in their garden but also use pesticides and chemical fertilizers. We can get organic produce in the grocery stores, but it comes from far away (sometimes California) and has traveled many weeks in transit. I love your site and podcasts and am trying to improve our diet, but organic isn't a local option for us. Thank you for all that you do to educate people! That's a tough spot, Kimberly, and one to which many of us relate. To gather information for this post, I asked Kimberly's question to three of my own local farmers. 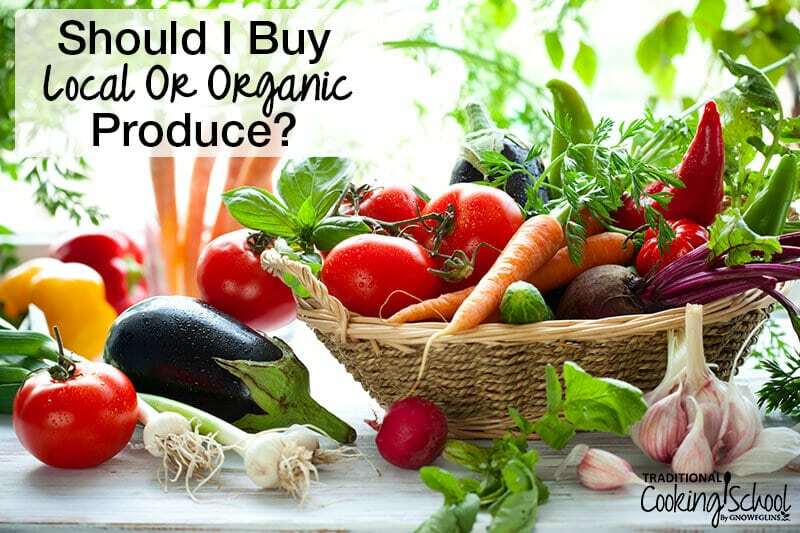 Let's discuss the differences between local and organic produce, questions to ask to your local farmers and stores, and then answer the ultimate question: Should I buy local or organic produce? 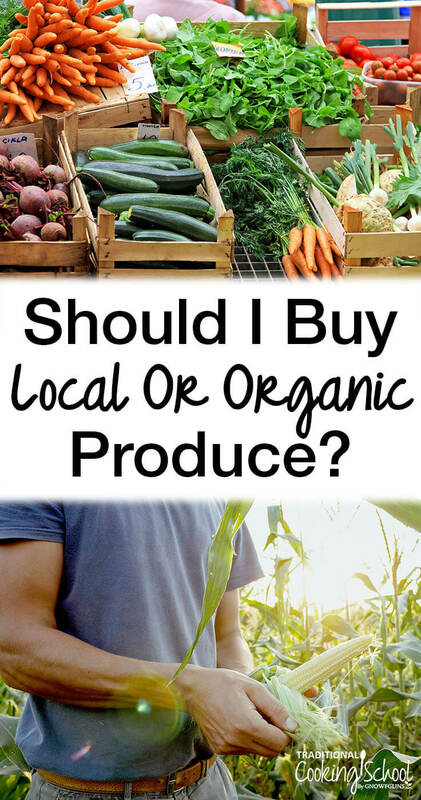 Local Vs. Organic: What's The Difference? When something is grown locally, that means it comes from a geographically close location, such as a nearby farm, orchard, field, or chicken house. Local foods often come from small family farms, yet they also come from large corporations that happen to be in one's local area, and every other size of operation in between. “Local” can mean that the foods come from your state of residence, within 300 miles, within 100 miles, in the next county, in your town, at a farmer's market, and finally, as local as local can get: from your own backyard. Locally grown or raised foods are very often organic. Although, as Kimberly is experiencing, local farms often use chemicals, too. The definition of “organic” is, unfortunately, less clear. Traditionally, “organic” foods were grown without the use of chemicals (pesticides, herbicides, etc.) or genetic modifications. An “organic” animal, on the other hand, was raised on its natural diet and without the use of growth hormones, GMOs, and antibiotics. The caveat to organic certification is expense — it is extremely time-consuming and expensive for farms to become and remain “certified organic”, whether with USDA certification or through another agency, such as Oregon Tilth. You can find organic foods pretty much everywhere now: supermarkets, Walmart, small health food stores, even gas stations are carrying organic items! You can also find organic AND local produce, however that often requires some proverbial legwork — or “Googlework” and probably some phone calls, in this case. Search Google for farmer's markets, farm stands, and/or community-supported agriculture (CSA) in your area. Check community bulletin boards, your local library, or community Facebook “sell and swap-type” pages. LocalHarvest.org — a site dedicated to connecting conscious consumers with local farms and ranches. Type in your location to find farmers markets, CSAs, farms, restaurants, and other places that offer local (often organic) produce nearby. Eat Well Guide — Search over 25,000 hand-picked restaurants, farms, markets, and other sources of local, sustainable food. Homeschool groups — I've found a grass-fed beef source, a Kombucha SCOBY, and a raw milk farm just by asking around in homeschool groups. Do an “in search of” post on Craigslist. You may end up with non-organic results, but it's worth a try. Call your local chamber of commerce. As mentioned above, organic certification is costly. Most small family farms cannot afford to become certified. So, while these farmers follow strict organic farming practices (and often go above and beyond those practices to include regenerative agriculture or biodynamic farming), their farms won't come up in searches specifically for “certified organic” produce… because they aren't certified. This does NOT mean, however, that you shouldn't buy this produce! You may also need to consider your definition of “local”. Are you expecting to find lots of options within a few miles of you? Good luck with that! You may need to broaden your search to within a 100-mile radius or even within your state. If you do find organic produce further away, be prepared to “go in” with others who are also interested in local food sources. Be willing to share the costs of travel or time to get these foods. […W]e have formed some wonderful, friendly relationships with our local farmers. I can tell you that they love nothing more than the work they do, and they love it when we, their customers, show interest in that work. Building relationships with our farmers and ranchers is, I believe, a key part of the entire concept of nourishing, traditional, whole foods. It is about so much more than just buying the foods we want to eat. It's about community! I am passionate about connecting with these people in my community. If they're growing food organically, they're probably doing other things I'm interested in, too. Like raising pastured chickens, bee-keeping, foraging, using herbal remedies, and more. I don't just want to buy their amazing vegetables; I want to know them! Furthermore, if we're serious about supporting our local economies while supporting our health with chemical-free food, we have to establish those relationships and start those conversations. So, how can we do that? First, reach out and express genuine interest in the farmer's operation by introducing yourself. Pick up the phone and call. Or, write an email. Refrain from opening the conversation by telling them how organic produce is superior. Wait to inundate them with tons of questions. Instead, ask them to tell you about their farm. 🙂 Remember, many local, small family farmers are not organic-certified. If they're practicing organic principles, it WILL come up, I promise. Organic farmers are proud of what they do, so they don't keep that part a secret! If it doesn't come up organically (pun intended), then you can ask if they use any organic farming practices. Notice that I don't say to ask if they use chemical sprays or GMOs? Again, farmers truly using organic practices jump at the chance to tell you they don't use pesticides or GMOs, that they save their own seeds or grow heirloom varieties, or that they use homegrown chicken manure instead of chemical fertilizers. What If The Farmer Doesn't Grow Organically? You may talk to a farmer who doesn't grow organically, but maybe they're interested in learning more. It's important to remember that this is part of their livelihood. Changing anything about your livelihood is difficult, especially when you're relying on what you know works to ensure a successful growing season with a bit of profit. Smart growers will respond to demand. So, if there's enough demand for organic produce, they'll often (though not always) rise to the occasion. Take the opportunity to respectfully ask your local growers not to spray their plants. If they're willing, you should also be willing to pay a bit more for this produce. Finally, you may talk to a grower who is passionate about using Roundup and Miracle Grow. They may have experimented with organic growing in the past, and failed. Or, they may prefer to use conventional growing methods for any number of reasons. Thank them for their time, wish them the best, and move on. Unless they express genuine interest in organic farming practices, you're probably not going to change their minds. Which Is Better: Organic or Local? What if, after all that, you still cannot find local and organic produce? What if you're left with an either/or decision? Which is better: organic or local? To help me answer this question, I spoke to three very good friends who also happen to be local, organic growers in my area: Honor Schauland, Kaare Melby of Finnskogen Farm, and David Abazs of Round River Farm. All three farmers overwhelmingly stated that, if your health is the only consideration, always choose organic produce if local + organic is not available. This is where local produce has big advantages! Especially if you can find a grower who uses organic farming practices, but can't afford organic certification. Friends, that is our ultimate question! To start with, every person has to choose what's right for them. I can't tell you if organic is better than local (or vice versa). What's important to me may be different than what's important to you. Or, my budget may be larger or smaller than yours. Values — if you have to choose between supporting your local economy and supporting non-local, organic farming, which is more important to you? Convenience — maybe you are in a stage of life where you need to be able to walk into a supermarket, buy everything you need, and go home, or sourcing foods from several local places is overwhelming to you. Even if you can’t afford organic apples, that doesn’t mean you should whip your cart around and buy boxed mac-and-cheese instead just because it’s cheaper. It means that you should buy the best apples you can afford, even if they’re conventional and were grown in Chile. […] Because here’s the deal: a conventionally grown, Chilean apple still surpasses a box of cereal or mac-and-cheese when it comes to the nutrition it provides. The bottom line is this: DO THE BEST YOU CAN. If your best is buying non-organic produce instead of Hot Pockets and Pop Tarts, then I’m sure not going to tell you that your best isn’t good enough. It's a happy, healthy mix of BOTH! I don't shop at supermarkets very often. Stores like Costco, Trader Joe's, and Whole Foods are not available to me at all because of my rural location. For most of the year, I purchase the majority of our organic produce from a couple of small, member-owned co-operatives. I also supplement with bulk produce from Azure Standard. Member-owned co-operatives are special because they will try to source food from the local economy as often as possible anyway. So, I can walk into a store and buy local and/or organic produce! During the summer, however, the majority of our organic produce comes from Finnskogen Farm, Round River Farm, Honor's farm, and our own garden. None of these farms are “certified organic”. Yet because of the relationships I've built with my farmers, I know my fruits and veggies are being grown organically anyway. Plus, I love knowing that my food purchases are supporting actual families in my community instead of large corporations that often use “organic” as a marketing term and little else. Finally, I make use of the Dirty Dozen/Clean 15 list when I have to decide on non-local produce that's organic and budget-friendly. Get a detailed description of how and where we source our food without access to health food stores here — How We Eat Real, Organic Food Without Trader Joe's, Whole Foods, and Costco. I bet there is local [and] organic production, sometimes it's hard to find though. If nothing local is organic, you are probably best to go for organic over local chemical food. Consider the definition of local. Local could be 100 miles away or more. There is undoubtedly an organic producer somewhere in their state. Grow food if you can't buy it! 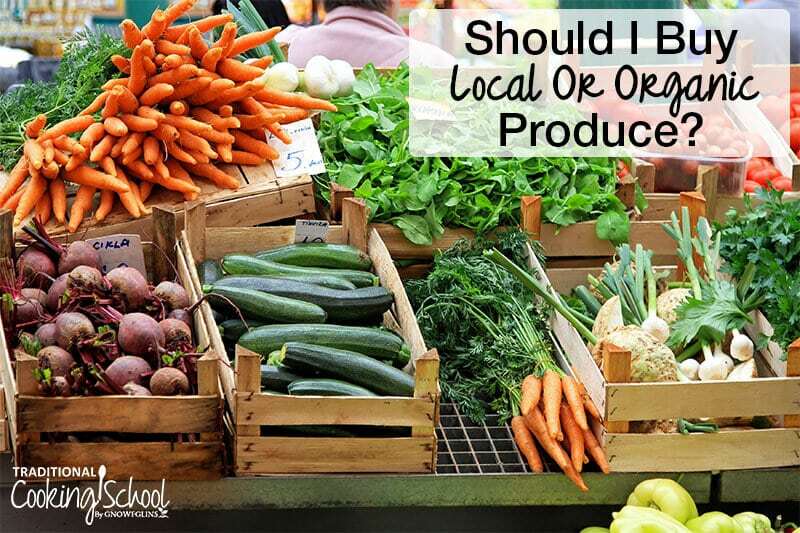 Which do you think is better: local or organic? Please share some of the ways you source local and organic food in your area! Lindsey, Thanks so much. Great information & I love how you inquired with farmers in your local area to answer the question about local vs organic. I also live in a very rural area of Ohio and am a CSA member with a farm about 70 miles from me. But, my local farmer (where I get my grass-fed and pastured meat, plus raw dairy) has a system with the CSA farmer and brings our boxes to his farm – which is only about 15 miles from me. I do have to go to the grocery store weekly to get things I can’t get at either place. Also, like you, Whole Foods and other great health-conscious groceries are (again) about 70 miles away. More than I can do on a weekly basis. So…thanks for the link to Azure. I definitely will keep that in mind. I do quite a bit of mail order from Thrive Market and the Grove Collaborative as well as my local farmers. Again, thanks for a great article and for helping to spread the word on eating organically and living a long life in great health. There is no scientific evidence that organic produce is better for human health. The organic label doesn’t mean they aren’t spraying as there’s a long list of “organic” pesticides and fertilizers that organic farms use. Many of these are just as dangerous to humans as the lab created treatments used by conventional farmers. You make 2 separate points which are jumbled together for confusion and misinformation. 1. There is much evidence that chemical fertilizers and pesticides are quite harmful to health. You ignore the carcinogenic rating of glyphosate which is NOT self-destructive. Nor do you account for the GMOs that turn up in human bodies, especially the umbilical cord of fetuses. Nor all the other studies showing the impact of these toxins on health. 2. The fact that Big Ag fudges the organic process does not mean organic is not better than chemicalized food. Your comment is the perfect troll-type comment from the big food industry but is not based in fact. 3. Organic food does have many studies and clinical experience to show the benefits of food that has more nutrients from healthy, non-chemicalized soil. 4. Granted, food is a big and complicated subject given the current conditions of agriculture in the world. But that does not mean using poisons to feed the world is better or even equal to organic or sustainably grown food. When visiting my local farmers markets, I always ask whether the farmers use pesticides or not. If so, I will reward them with my repeat business. If not, I buy organic at one of the local health food stores. The good news is that there are many farmers who choose not to use pesticides. A couple of points not mentioned but important. If you ask a farmer if he grows organically, the first response may be “i am not an organic farmer.” This is because it is illegal, I believe, to say you are an organic farmer if you are not certified. So the question needs to ask if they follow organic or sustainable farming practice. I run into this all the time at the very huge garlic festival in my county. So I always specify that I am not asking about certification but practices. I ask about fertilizers and where they come from and if they are non-GMO and organic. You may get some real fuzzy answers such as I get my manure from the neighbors but don’t know if they animals were organically raised. Big Red Flag. Assume the worse for self-protection. Organic food in supermarkets and places like Walmart are very suspect. These corporations get their produce from huge corporate farms. Corporate agriculture has been working to chip away at the organic standards which now do allow some chemicals to be used. So beware. Many of the so-called organic eggs at places like Walmart really are not. The free-range hens are actually not free range, often never even touching the ground. And last, but very important, has to do with the costs of the food. Organic food costs more mainly because government regs do not include small farms in their farm support programs which provide significant economic support for these corporate operations. So if real organic food prices are to be competitive and come down, the govt financial support programs need to be shared more equitably or stopped altogether. This is something everyone can grab onto and being lobbying their congressional reps on the State and Federal level. I would think that spraying with chemicals like Round-Up would be much worse than using Miracle Grow or other chemical fertilizers. Am I mistaken? I think you are mixing apples and oranges here. Glyphosate, which is in Round up, is a weed killer while Miracle-gro is a fertilizer designed to provide nutrients for quick plant growth. Glyphosate, especially in combination with other ingredients is quite toxic. It is now on the carcinogenic list in Calif and the UN claims the same potential. Miracle-gro ingredients, while presumably providing nutrients, has other ingredients the list of which I cannot easily/quickly find online. But it is not organic. So which is worse? I would try like heck to avoid both of them.